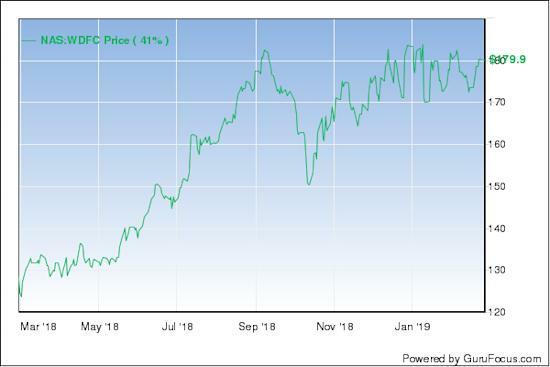 The stock price of WD-40 Co. (WDFC) has comprehensively outperformed the S&P 500 in the last year. It has risen 40%, while the wider index is up 2%. And the company's growth strategy has the potential to boost its stock price performance in the future. WD-40 will be focused on broadening the appeal of its variety of products. This includes making them available in more places, as well as seeking to leverage its pipeline of new opportunities. Investment in digital opportunities could further enhance its distribution potential. It is also bringing R&D in-house in order to improve margins and provide greater control over its product innovation.Although margins have been under pressure of late, price increases are set to largely offset the impact of raw material price rises. While not a cheap stock following its recent rise, dependable growth could lead to improving investor sentiment and further outperformance to the S&P 500. A key part of the company's growth strategy is understanding how to broaden the appeal of its maintenance products. Brands such as Spot Shot and 3-IN-ONE are contributing to the maintenance segment being on target to reach its goal of $70 million in revenue by 2025. The company is seeking to understand how each of its maintenance brands performs in their unique geographies and niches. This complements a plan to make its WD-40 Multi-Use Product available to more people in more places, while also seeking to broaden its potential range of applications. The plan helped boost its sales by 5% in the first quarter of fiscal 2019 to $78.3 million. The company remains on target to generate revenue of $530 million by the end of fiscal 2025. Specialist products are expected to become an increasingly relevant part of the company's range. WD-40 has invested heavily in product innovation and in maximizing its pipeline of potential new products. To that end, it will enhance its distribution through deliberate geographic expansion. Promotional programs and the ramping up of distribution channels are expected to continue over the medium term. Growth in the WD-40 Specialist segment of 13% in the first quarter of fiscal 2019 suggests that its 2025 target revenue of $100 million is achievable. WD-40 is investing in its digital and e-commerce capabilities. It hired six new members of staff with expertise in those areas in the most recent quarter to catalyze its online growth opportunities. This is expected to help the company to broaden the availability of its products to consumers in new geographies. The company is also building a new technology center that will house its New Jersey-based staff members. It will conduct laboratory-tested research and development in-house that had previously been outsourced. This has the potential to give the company more control over its product pipeline, as well as improve margins through speeding up the development cycle. It may also lead to greater innovation, which could mean greater product differentiation and a more distinct competitive advantage. WD-40's recent results highlighted that the cost of raw materials used in its products increased in the first quarter of the current fiscal year. This put pressure on gross margins across all three of its trading segments. For example, rising costs of petroleum-based specialty chemicals hurt gross margins by 1.6 percentage points, while increased pricing in aerosol cans caused a reduction in gross margins by 0.4 percentage points. This, though, was largely offset by a price rise across its three geographical regions, boosting gross margins by 1.2 percentage points. A further 0.4 percentage points of gross margin decline was offset by higher sales volumes and lower inbound freight costs.Therefore, the group's gross margin declined by 0.4 percentage points to 55.1% last quarter. Further price rises could be ahead, depending on the future cost of raw materials. Strong growth in its Europe/Middle East/Africa region and in its specialty product business is also expected to counter further increases in raw materials prices during the remainder of fiscal 2019. With a price-earnings ratio of 38, WD-40 is a highly rated stock. Its forecast growth rate in earnings per share of 11% for the 2020 fiscal year is impressive, but may not be able to justify such a high valuation on its own. The appeal of the company, though, lies in its ability to offer dependable growth through a solid, long-term strategy. The investment it is making in areas such as R&D, digital growth opportunities and in broadening the appeal of its products could lead to a greater competitive advantage, as well as a higher growth rate. While there are cost pressures facing the company, its wide economic moat is evidenced by the scope for price increases. After a strong performance over the last year, further gains could be ahead for the stock.